Guest interviewer Stuart Hayton learns about exciting growth for a North American EMS provider and how this is leading to significant new investment in capital equipment. 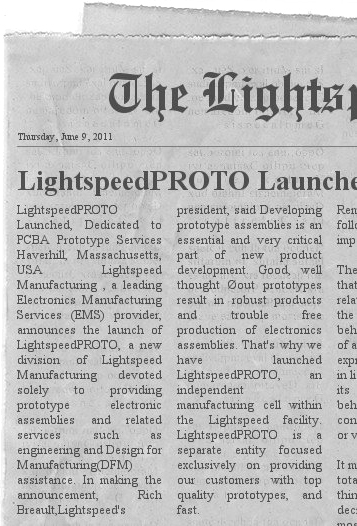 Haverhill, Massachusetts, USA – Lightspeed Manufacturing , a leading Electronics Manufacturing Services (EMS) provider, announces the launch of LightspeedPROTO, a new division of Lightspeed Manufacturing devoted solely to providing prototype electronic assemblies and related services such as engineering and Design for Manufacturing (DFM) assistance. In making the announcement, Rich Breault, Lightspeed’s president, said “Developing prototype assemblies is an essential and very critical part of new product development. Good, well-thought-out prototypes result in robust products and trouble-free production of electronics assemblies. That’s why we have launched LightspeedPROTO, an independent manufacturing cell within the Lightspeed facility. LightspeedPROTO is a separate entity focused exclusively on providing our customers with top-quality prototypes, and fast. Services offered include 72-hour fast prototype assembly, Turn-key PCB assembly service, and Box Build services, among others. 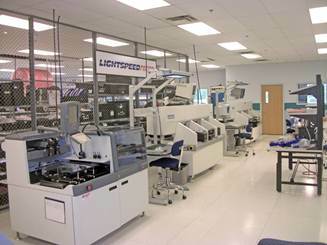 Lightspeed Manufacturing is a leading EMS/ECM provider of RoHS compliant Lead-free SMT and PTH PCB electronics assembly, SMD / BGA Rework, BGA Reballing, Rework and Repair, with On-Site X-ray & AOI Inspection of PCBs. Lightspeed specializes in all types of electronics assembly, from BGA services to Prototypes to PCB assembly, box build, and chassis assembly, providing a wide range of quality services fast and on time. Lightspeed’s unsurpassed level of individualized customer attention that has made the company a recognized, leading EMS provider. For more information, visit www.lightspeedmfg.com.